A new report from the World Gold Council shows that record investment in the first half of 2016 pushed the price of (US) gold by 25% in the first half of the year, the biggest price rise since 1980. And far from being a ‘one-off rally’ at the start of the year, as some analysts originally predicted, global demand for the precious metal shows no signs of slowing. “The growth for quarters one and two was actually 16% higher than the first half of 2009 – the time of the recent financial crisis,” says senior bullion dealer, Oliver Temple at Gold Investments. “As we have been reporting recently ourselves, there are number of factors that are increasing demand. In the UK, we still not know how much of a fallout there will be from Brexit. This uncertainty will be having an effect on investor confidence and making gold more appealing. "New investors in particular may well be attracted to gold because of the possible introduction of negative interest rates on bank accounts. Sovereign and Britannia coins are popular, for instance, because they are free from Capital Gains Tax. One area of the gold market which has not performed well for the first two quarters is the jewellery market. According to the WGC report, gold jewellery demand was at its lowest first half total since 2012. China bought 322.5 metric tons during the first half of 2016. “We are coming up to key festival seasons in India so we are expecting the gold jewellery market to recover,” Temple predicts. Temple says the message remains the same for those interested in purchasing gold. 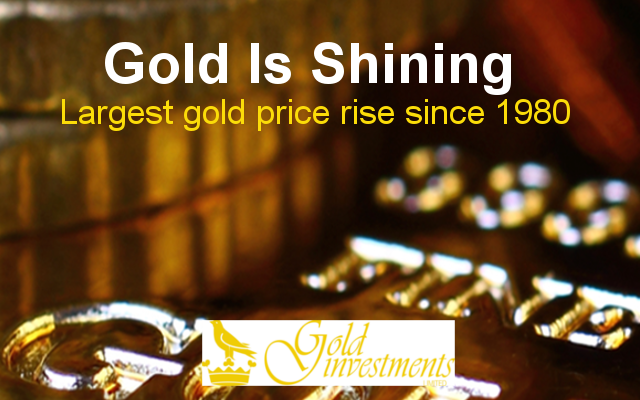 Gold Investments has been trading since 1981 and is one of the oldest bullion houses in the UK. “We would advise anyone interested in exploring investing in gold to talk to us. We have built up a wealth of experience. We are near Bank in the City,” says Temple.